Category of consultant-Environmental Planner.Total -02 Posts. Remuneration-50000/- per month.Period of Contract-One year.Maximum age-40 Years. Remuneration-30000/- per month.Period of Contract-One year.Maximum age-40 Years. 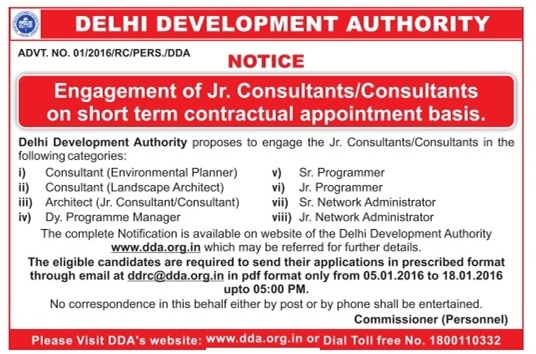 Category of consultant- Dy. Programme Manager.Total -01 Post. Remuneration-75000/- per month.Period of Contract-One year.Maximum age-55 Years. Remuneration-40000/- per month.Period of Contract-One year.Maximum age-50 Years. Remuneration-25000/- per month.Period of Contract-One year.Maximum age-40 Years. Remuneration-60000/- per month.Period of Contract-One year.Maximum age-45 Years. Remuneration-40000/- per month.Period of Contract-One year.Maximum age-40 Years. The minimum disability should not be less than 40%. for these posts. How to apply-The candidate shall send the bio data in the prescribed format. Last date of application-18.01.2016 up to 5:00 PM. The date, time and venue of the interview will be intimated at a later date.